Sometimes things just fall flat. Pancakes. TV screens. Chests. Cookies. Sometimes you get wrapped up listening to your Stevie Wonder station on Pandora, and you’re twirling around in your new apron, and you’re licking cookie batter from your fingers, thinking that these cookies are going to turn out great, but maybe you should add something else. Maybe white chocolate chips? And more cream, definitely more cream, because the creamier the better right? Sometimes you get wrapped up in things like that, you forget that there is a reason why people say that baking is an exact science. Because even if you’ve modified many recipes in the past, sometimes – sometimes – it just doesn’t work. And you end up with flat cookies. While these cookies may be flat (and really, they’re not even that flat – just not as round and crumbly as the original recipe should’ve created), they still taste marvelous. 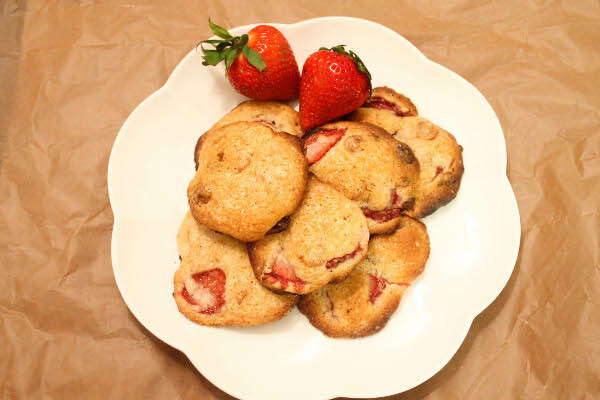 They started out great – with luscious, juicy, sweet sweet strawberries, hanging out in a mixture of lemon juice and lemon zest-infused sugar. Rubbing lemon zest into sugar releases its oil, and in turn you end up with this beautiful smelling citrus sugar. 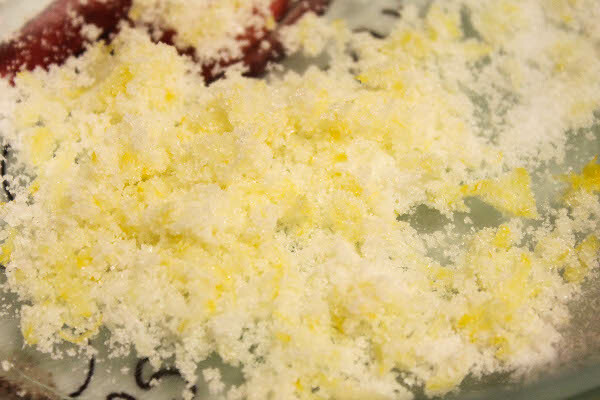 Remember this the next time you are making a margarita or a martini, and use this lemon zest-infused sugar to rim your cocktail glass. Or if you just want to dip strawberries right into this and go to town, I’m not judging. 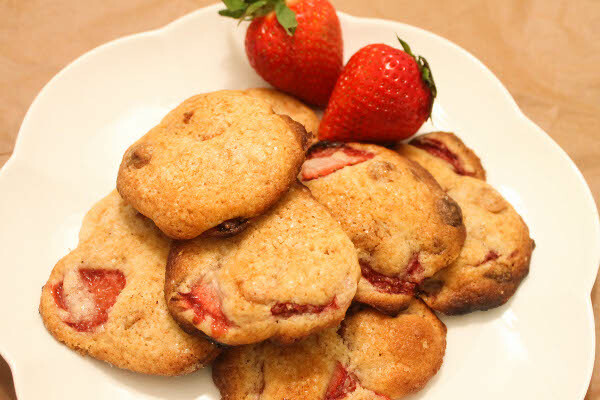 Back to these strawberry shortcake cookies. See, they actually are pretty lovely, with the summery flavors of strawberries and cream, and the hint of lemon freshness. And I swear it’s not just me who think that they’re lovely. I gave these to my friend Tyler while we were watching The Hunger Games, and by the time Peeta was waving to the crowds at the Capitol, half a dozen of these babies were already gone. So while they look like a kitchen fail, they taste like a kitchen win. I did not end up with a crumbly, buttery, biscuit-like cookie, but these cookies were very cake-like (flatcakes?) 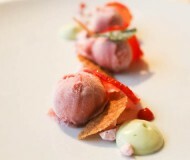 and definitely reminded me of strawberry shortcake, but with the added sweetness from the white chocolate chips. Could I have done without the white chocolate? Of course. But you know me. – I also may have overbaked my batch of cookies. Eep. Hey, I’m the one who urged you all to not be too hard on yourself when things don’t go as planned. Because it happens. Sometimes cookies fall flat. And get burnt around the edges. And they don’t end up looking quite like what you expected them to be. But they’re still soft. And lovely. And worth it. Kinda like relationships. But that’s a whole different story. Haha love the disclaimer on the end. Families can be funny like that. Love this article and wanted to let you know that I consider those browned, burnt edges to be the best part of most things! 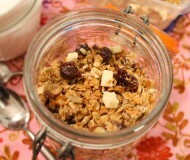 I am off to check out the recipe and make sure I can whip up a batch of these this week. Those cookies look fantastic! I kind of like cookies that are soft but a little burnt on the edges. 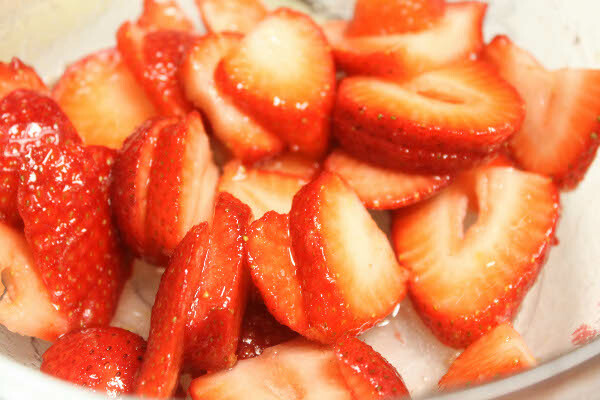 And you can’t go wrong with sweet, sweet delicious strawberries! oh I think these look great! looking at that ingredient list- I’m sure I would love them no matter what shape they were! I like when recipes turn out different from what you expect but still good. The lemon zest infused sugar probably added such great flavor! flat or not, they look delicious! As long as it tastes good, I’ll eat it! These still look great. 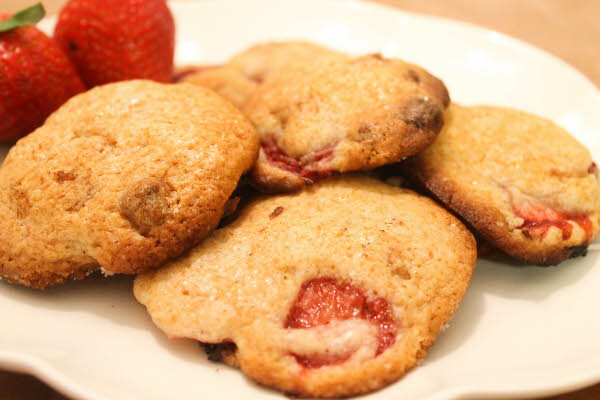 I love making strawberry shortcake cookies. you are too cute. these still look awesome to me, I like the changes you made. If you hadn’t mentioned the mistake, I wouldn’t have known! 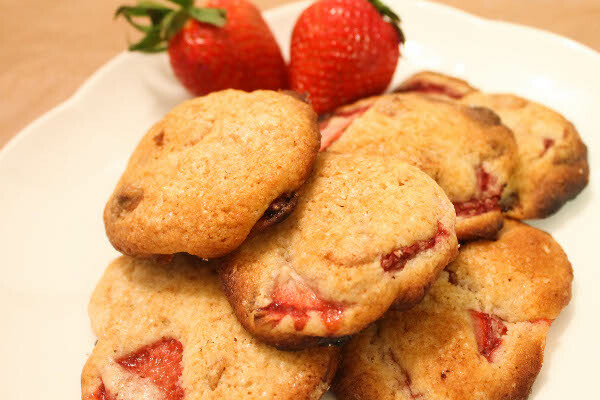 They look amazing, and the chocolate and strawberry combo sounds perfect in a cookie! Haha! We all have to be reminded once in a while that we’re just humble bakers learning by trial and error! These cookies still look delicious, though. They don’t look too flat to me!! They look delicious! 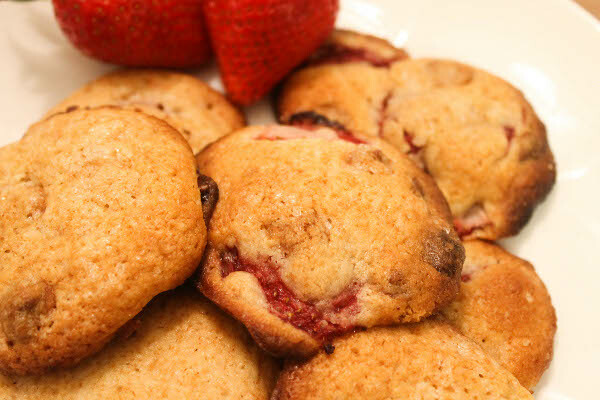 I have a huge bowl of strawberries just begging me to make them into these cookies!!! So amazing. Yum! I love these cookies! I’ve made them a bazillion times, including for a wedding last summer when I also put in extra cream! Somehow my cookies miraculously came out, but I found that they taste amazing no matter what you do to them. Definitely no reason to be hard on yourself… even ugly things have the potential to taste outrageously delicious! 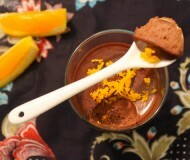 Also – great idea with the lemon sugar. These look so wonderful! I love strawberries any way I can get them. Cooking is the last place anyone should be critical with themselves, at least you are doing it which is more than most people these days. Baking can be so tricky. I’ve had the exact same cookie recipe turn out completely differently on different occasions for various reasons like forgetting to chill the dough or using butter that was too cold or using a crappy cookie sheet. It’s frustrating. I definitely did not chill the dough – that may be another factor! Yes, frustrating, but at least they were still tasty :) I will probably give them another shot this summer! Just top these with scoop of vanilla ice cream and you’ll be good to go! Presto, change-o! This is definitely the perfect spring cookie! The addition of the white chocolate probably makes them taste even more like the classic Strawberry Shortcake even more. These look delicious! I think I tried these once when Megan made them.